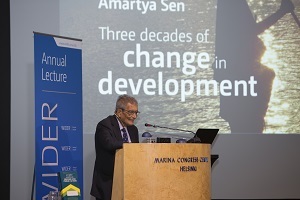 The 2015 WIDER Annual Lecture was given by Nobel laureate Amartya Sen. He discussed the overall challenge of sustainable and human-focused development including new and old challenges. The WIDER Annual Lecture is delivered by an eminent scholar or policy maker who has made a significant contribution in the field of development and social sciences. This year the lecture was given by Nobel laureate Amartya Sen, a leading international economist and philosopher. He discussed the overall challenge of sustainable and injustice-reducing development which includes new problems as well as old adversities. Much progress has been made on the old issues of poverty and inequality, but there remains much to be done. Sen will discuss how these issues are complicated by the rise of two new concerns; climate change and increasing global insecurity. The lecture was followed by further discussion of the topic by Amartya Sen and the audience. Short biographies of those who contributed to the event. Africa and India: What Do We Have to Learn from Each Other?